Premature Nostalgia: Cabbage is a popular euphemism for. . . If you ever read any historical information on Toronto's Cabbagetown, you'll learn that the area was settled by early immigrants, many of whom were Irish. The area earned its name because the first inhabitats of the neighbourhood grew cabbages in their yards to feed their huge families since they were poor, and it was such a cheap, hardy vegetable. Informational websites on Cabbagetown claim that this is no longer the case, and that current residents of the area are wealthy enough to afford more than just cabbage. Sasha bought this massive cabbage, larger than her head, about a month ago. 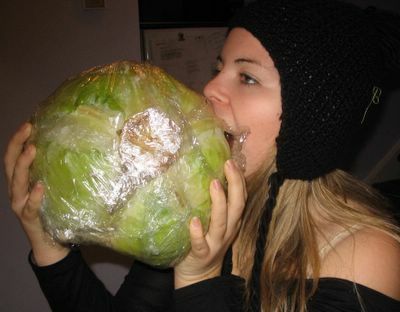 Why did she buy such a large cabbage? Because it only cost 97 cents. Nihoa stop hitting on my internet link friend's friends. I find it super creepy that we simulatenously commented on each other's blogs. Haha I was like Oh my God WE RULE!